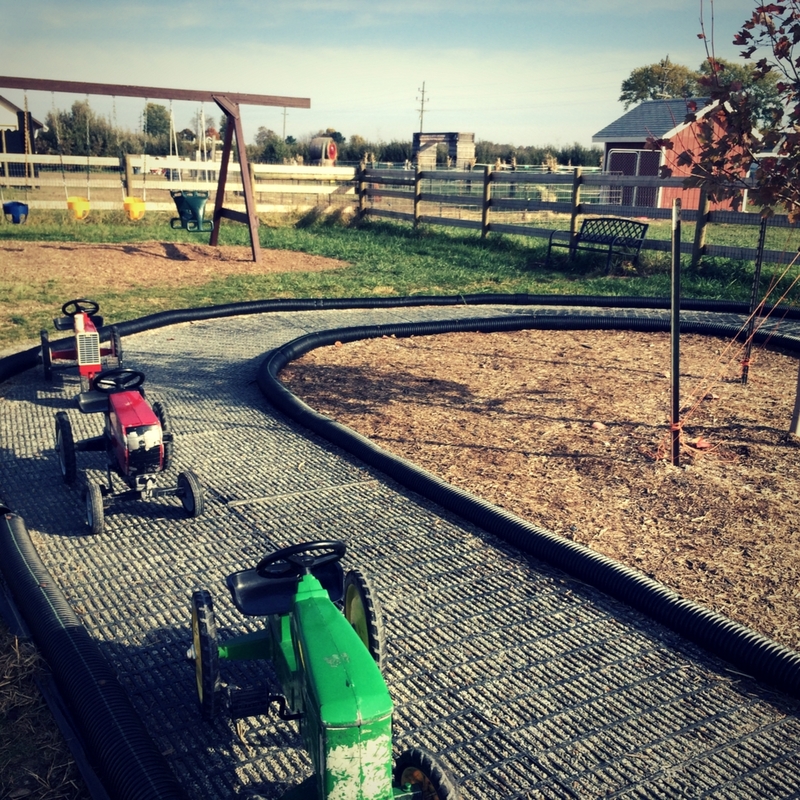 Fall Birthday Parties at the Orchard - Tuttle Orchards Inc: Indianapolis Apple Orchard, Pumpkin Patch and Farm Store. Party host to keep the party rolling and to make your child feel special! Cupcake for each party guest and candle for birthday child. Choice of apple cider slush or hot apple cider for each party guest. Reserved birthday party area for enjoying cupcakes. Fall decor in party area, cups, plates, candles, etc provided. Hayride passes for each party guest (12 children, 3 adult chaperones). Every party guest takes home bag of 4 apples (September) OR small pie pumpkin (October). Admission to Kids Farm Play Area AND Agrimaze for all party guests. Package includes complete party experience for 12 children and 3 adult chaperones. Cost is $250. For the optimal birthday party experience, Tuttles suggests limiting your party to 12 children. If there is a need for an extra child, the cost is $15 per child. Any additional adult chaperones are no charge; however please keep in mind that only 3 adult chaperones will receive hayride passes and apples/pumpkin to take home. Additional chaperones do not receive these items. Choice of hot dog or pulled pork sliders and Tuttle’s homemade applesauce for meal. Reserved birthday party area for enjoying meal and cupcakes. Package includes complete party experience for 12 children and 3 adult chaperones. Cost is $350. For the optimal birthday party experience, Tuttles suggests limiting your party to 12 children. If there is a need for an extra child, the cost is $20 per child. Any additional adult chaperones are no charge; however please keep in mind that only 3 adult chaperones will receive hayride passes and apples/pumpkin to take home. Additional chaperones do not receive these items. Additional adult chaperone lunches can be purchased for $8/each if desired. Twenty cupcakes for guests and candle for birthday child. Families may bring a smash cake if you would like. Twenty apple cider slushies or hot apple cider. Reserved birthday party area for one hour to enjoying cupcakes. Twenty hayride passes for party guests (children and adult require passes…any combo of children/adults is fine). Twenty Combo passes for Tractor Town & Agrimaze for party guests (children and adult require passes…any combo of children/adults is fine). Twenty party guests takes home bag of 4 apples (September) OR small pie pumpkin (October). Package includes complete party experience for 20 participants (any combination of child and adult). Cost is $350. If there is a need for an additional person, the cost is $15 per person (this includes cupcake, cider slush, combo pass, hayride, pumpkin or apples). There is a limit of 30 people for any family birthday parties due to space. You can choose to add on lunch for participants for an additional $10 per person. The time frame for the party is picking and hayride for the first hour, party room for second hour. 1st Hour: Welcome, time to enjoy the Kid’s Adventure Farm, and hayride. 2nd Hour: Time in Party Area to enjoy cupcakes (and lunch if choosing Deluxe Birthday Party package). After the party, guests are free to enjoy Kids’ Adventure Farm and Agrimaze. Saturdays: 10:00AM -12:00PM, 12:00PM-2:00PM, 2:00-4:00PM, 4:00-6:00PM. Monday-Friday: 4:30PM-6:30PM (additional weekday times may be available upon request – please just call and ask). Please encourage your guests to arrive at the scheduled time for your party as we don’t want anyone to miss out on any activities. Special Note for 4:30PM parties: for 4:30PM parties, please keep in mind that all Tuttle’s areas close at 7PM. This includes ALL outdoor areas and picnic areas. We allow two hours for your party reservations to insure all guests have opportunities to complete all activities before closing hours. If you want more time for the Agrimaze or Kids Activity area – please plan to come before the party time. What do we need to bring? Tuttle’s provides everything you need to have a great party. All you need to bring is yourself and your camera! Tuttle’s does not allow outside decorations or food of any kind to be brought onto the farm. Let us do the work for you! We will provide all table decor, food, drinks, etc. Food Policy: We do not allow outside food to be brought to the farm. Additional food can be purchased from the Tuttle’s Grill or Cafe if needed. Please advise us of any food allergies before the event. Inclement weather? If inclement weather occurs the day of your party, we will need to reschedule as the hayride and adventure farm will be closed. You may call us the day before your event to discuss options if inclement weather is forecast. We can often reschedule for another week if you would like. However, because of changing weather forecasts, we do not make plans to reschedule events until one day before the event. Cancellations: If you need to cancel your reservation, please contact us at least 4 days before your party. If you fail to give us 4 days notice for a non weather related cancellations there will be a $50 cancellation fee. If Tuttle’s staff makes the decision to cancel party due to weather the day before the event, there is no cancellation fee. Where should I check in for my birthday party? You will check in at the upick barn located as you enter the upick area (same side of road as large parking lot). Ask for the Birthday Party Hosts and they will be happy to assist you. Please plan to arrive for your party to check in 15 minutes before your party is to start. Your group activities will begin at the scheduled time for your party. Where and when should I pay? You will pay for your party when you arrive and check in at the upick barn. We accept cash, checks, and credit cards. Where should I tell participants to meet? Your party experience will begin in the upick area. The upick area is located on the same side of the road as the parking lot. Have participants come to the upick check in area and ask for your party. Tuttles staff can direct them to your group. Questions: If you have any questions, or if we can make your party experience better, please contact us at 317 498-1009.